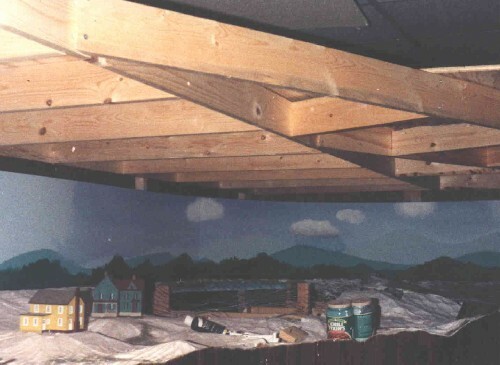 My home layout, sadly, was dismantled in 1991, when we moved. 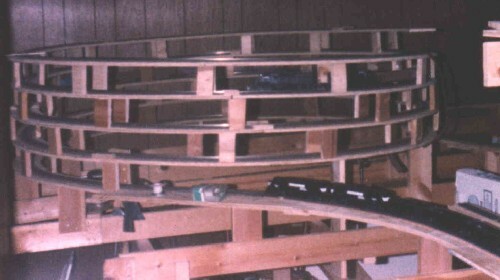 The layout filled a basement area that was 27' x 34', it had two complete levels connected by a 30" radius helix. Above: This view shows a rural area just outside of the yard limit of a coal classification yard on the lower level. The second level has two GP-40's sitting on a track in the classification yard. Above: Two SD40-2's are leading a fifteen car unit coal train up the helix, while two GP50's ,with another unit coal train, wait in the passing siding of a lower level town. Above: This area was to the right of the top-most photo location. The lower main continues through a wall to the far right and into a staging yard. The upper level, which has a very impressive underside <G>, has the servicing facilities for the large upper yard.